Heard a lot about Beverly Hills Cop over the ages and there is more talk about the making of a new one, so I decided to Tivo the first and check out what all the fuss was about. This review won't be long, becuase there really just isn't much to say about this train wreck of a film. I have heard that this was the film that launched Eddie Murphy into film stardom, and that history I couldn't agree with, what I would question, is what about his performance made this legendary? Through much of the film Murphy gets to say foul mouthed and degrading things to people who are in superior positions to him, and I think much of the popularity stemmed from that. 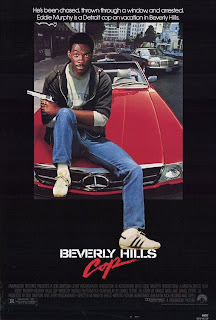 I mean the title and poster of the film itself speaks to what we should expect, a black guy as a cop in Beverly Hills. I guess audiences in 1984 might have found this funny then, but it felt extremely dated to me. Not only does Murphy seem like he's sleep walking through the film (apart from the time he decides to let out one of his signature laughs or when he's at a strip bar), but he delivers his put downs, and witty responses in such a monotone manner, that the punchlines seem muted. Add to it, that he's so disrespectful, so often, that it strains credibility that he could honestly be a real character at all. On the bright side, the film has a fun soundtrack (another aspect that extremely dates the film), and its obvious influence on later cop comedy films that would later come (hello Chris Tucker in Rush Hour) makes it worth a watch. Add to that a decent performance from Judge Reinhold and its not all bad.